If you've previously defeated Launch Octopus (which tends to happen by following the recommended course), this stage will be partially flooded, providing access to additional areas. 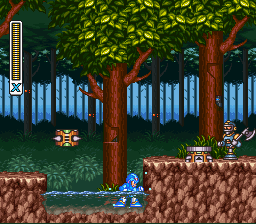 Sting Chameleon and many other nasty robots preside in a large forest. 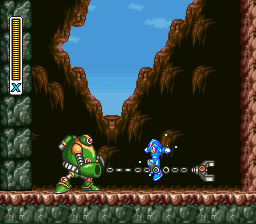 In this level, you'll find a Heart Tank and the awesome Armor Upgrade, which reduces damage taken by 50%. 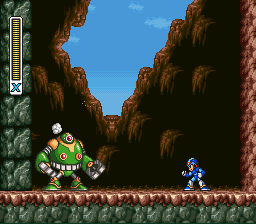 It features one sub-boss, but he's fairly easy. Notice the Planty hidden in the water. Go to the right and you'll notice a pit full of water, as well as an Amenhopper (the frog-like robot). Destroy it and jump over the pit (there's also a Planty in the pit... he's disguised as a small bush, but doesn't pose much threat). Either avoid the Tombot or destroy him. 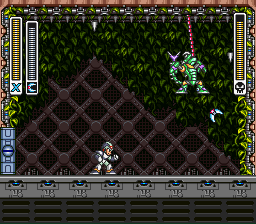 You can destroy the Tombot by simply shooting at him through the ground, or you can completely avoid him by jumping over his platforms. Along the way you'll encounter another Tombot and some more Amenhoppers and Planties. Smoke will start to come out of him when he's almost dead, and when he finally is, a capsule will appear. Step inside and get the Armor Upgrade, which reduces all damage taken by half, then head back into the tunnel from before. 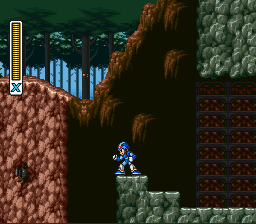 Scale the wall above the tunnel (by dash jumping from the cliff before the pit) and go to the right. 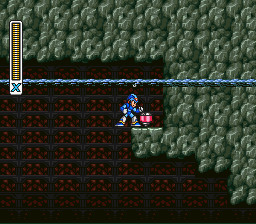 Some falling rocks will block your exit, and the sub-boss, RT-55J, will appear. His head and chest are the only vulnerable areas; shooting his claw will only cause your shots to deflect. 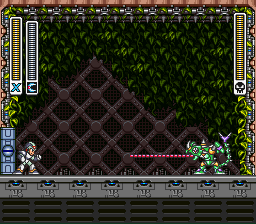 Just keep jump shooting, and when he tries to jump, simply dash to the other side and keep on firing. He may try to attack you with his claw, so if he does, just jump over it and deliver a fully-charged blast, then jump back out. Scale this wall and get to the top. Remember to keep shooting at his head and chest. Jump over his claw if he uses it and then shoot him. Smoke will appear when he's almost dead. This heart tank is only reachable if Launch Octopus has been defeated (which he should be, if you followed this guide). Before going down into the tunnel, jump into the pit right before it (sounds scary but don't worry) and destroy the blocks with your Leg Upgrade. Stand at the edge of the small platform and perform a dash jump (do not dash jump off the wall of breakable bricks, as you will hit the ceiling and fall to your death), which will cause you to land on the platform that's on the other side; pick up the Heart Tank and go back the same way you came. 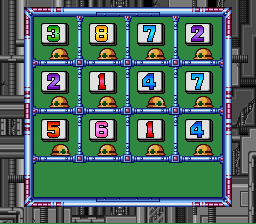 ...then destroy the blocks and stand in the position shown. 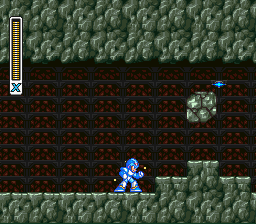 Note: if you break the two blocks to the left of Mega Man, you will have more room to perform a dash jump. Dash jump from there to reach the platform with the heart tank. Careful of the rock guys on the ceiling! Careful going through this tunnel, as small rocks can drop from the ceiling and stack up. 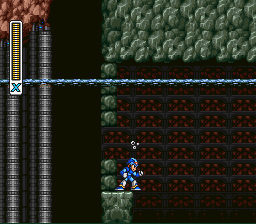 Interestingly, if you took the time to beat the mid-boss for the Armor Upgrade, the small rocks won't fall in this area. When you go through the tunnel, you'll notice some oddly shaped rocks on the ceiling: these are actually enemies, and when you go near them, they'll fall and begin to attack you. As soon as they fall, deliver a fully-charged blast to quickly destroy them. 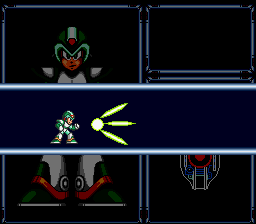 You'll encounter four more of these guys as you go through the tunnel. Once you get out of the tunnel, some woodpecker robots will try to attack you, but they can easily be dashed past. Scale the next wall and you'll encounter a Hoganmer: destroy him and take the extra life he was guarding, then scale the next wall. Ride the Mech Armor until you get to the dungeon entrance. 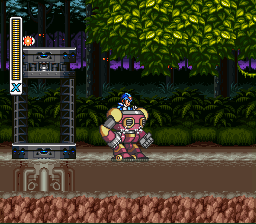 In the final area, you can ride a Mech Armor, similar to the one in Chill Penguin's stage. Jump inside and go into the mud. 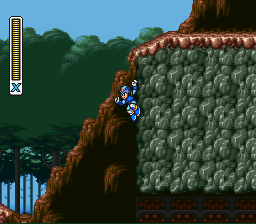 Careful though, because if you go too far into the mud, you'll have to jump out of the mech armor and go by foot. 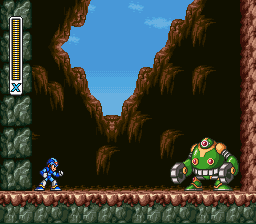 Along the way you'll encounter some flying robots and other Mech Armor riders. 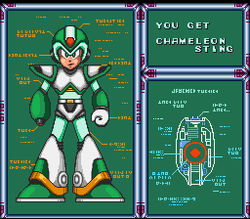 When you get to the end of the area, step inside the dungeon to fight Sting Chameleon. Sting Chameleon can be a challenging and unpredictable opponent, but with his weakness, the Boomerang Cutter, he's merely the opposite. 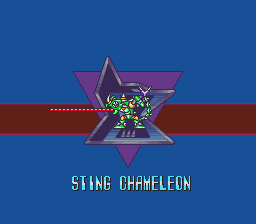 Sting Chameleon has three different attacks. He'll most likely start the fight by hanging from the ceiling with his tongue and then shake back and forth to make spikes will fall from the ceiling, so try to dodge them. His second attack is to cling to the fence in the background and swing his tail to shoot a trio of stingers at you. His third attack is a literal tongue lashing, which he'll usually do if he's on the ground. 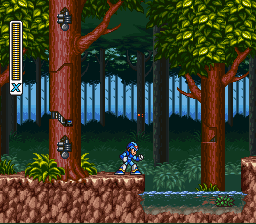 Finally, usually after the tail sting attack, he'll go into his camouflage, blending into the background so he can't hit or be hit, but you can still notice his position from the wavering in the background. Get into position and wait for him to re-appear when he does this. The best strategy is to shoot the Boomerang Cutter at him while he's above ground (remember to be on the ground while shooting so it goes upwards), a hit will force him down and make him jump up again to reposition, allowing you to get into a lethal pattern of hit, reposition, and hit again. Chameleon Sting! This fires a plasma ball which then separates into three spikes that travel diagonally upwards, straight ahead, and diagonally downwards. Another one cannot be fired until the spikes disappear off-screen. This page was last edited on 11 October 2018, at 16:45. This page has been accessed 133,589 times.